105- 161 of 2012 wOws! My “word” for 2012 is wOw! wOw! is one of those fabulous words that fits positive, negative and neutral situations. It’s a word we can use when no other will work. 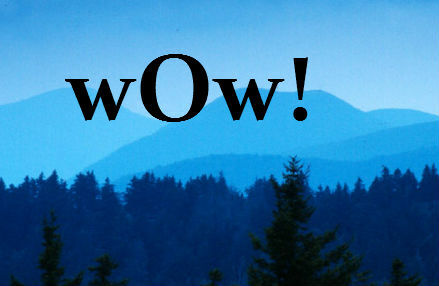 Over this next year of Sundays, I’m going to share some wOw!moments from the previous week. By December 31, 2012, I’ll have shared 2012wOw! moments. I hope you’ll have spotted (and maybe even shared) close to that, too. Am eager to hear about your wOws! from this week! Previous post53-104 of 2012 wOws! Next postThe Naked Face Project ~ count me IN! Too bad you’re too modest to self-wOw! You’re amazing, Lisa! WoW What trip you had Lisa…………..
How about, how BAD our dog, Nina, smelled after apparently rolling in the remains of some decomposing animal she found in the swamp? (She was so pleased to bring it to us and lay it at our feet!) Luckily, this “grossed-out” wOw was soon followed by the wOw of how soft and silky and good smelling she was after her bath with lavender scented baby shampoo! * Finding out Virginia Beach’s Ambulance is the nation’s largest FREE service. * My BFF making me laugh uncontrollably when I needed it most. * Making hats on a circular loop. * Possibility of a REAL job. Life’s meant to be shared. And sharing it with you is always a joy. Mary Louise, LOUD CHEERS for Ninja-wOws! Linda, SO PSYCHED about ALL of your wOws. keep healing dear BFF. Tom, i’m beyond honored and humbled to be your life partner. thanks to you all for wOwing me!